This book describes the state of the art concerning some of the most hotly debated topics in anesthesia and intensive care and is at the same time intended to serve as a useful practical guide that will assist in improving outcomes. The topics covered are wide ranging and include, for example, the use of antibiotics during renal replacement therapy, the role of video laryngoscopy, management of mechanical ventilation in the operating room, use of high-frequency ventilation in patients with respiratory failure, management of the potentially brain dead patient, perioperative delirium, cardiac protection during general anesthesia, single-lung ventilation, and use of lung imaging in critically ill patients. 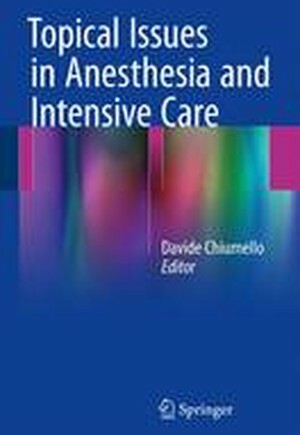 Written by recognized experts in the field, the book will offer a comprehensive and easy to understand update for specialists and students of anesthesia and intensive care. Antibiotic dosing during Continuous Renal Replacement Therapy (CRRT).- Video-laryngoscope: a review of the literature.- Lung ultrasound in the critically ill patient.- Does high frequency ventilation have still a role among the current ventilatory strategies?.- Non-Invasive Assessment Of Respiratory Function: Capnometry, Lung Ultrasound And Electrical Impedance Tomography.- Protective mechanical ventilation In brain-dead organ donors.- Management of perioperative arrhythmias.- Obstructive Sleep Apnoea Syndrome: What the anesthesiologist should know.- Post-surgical liver failure.- Postoperative delirium.- Perioperative protection of myocardial function.- Regional anesthesia in ambulatory surgery.- One Lung Ventilation In Anesthesia.